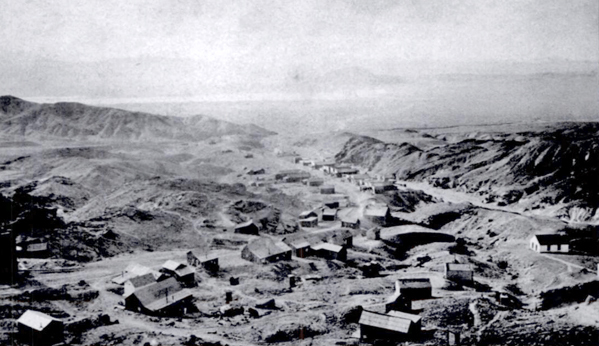 During the great silver boom in the Calicos, a small community grew up around the Bismarck mine in the next canyon east of Calico camp. Together with the miners of the Garfield, Odessa, Occidental and other mines, there were perhaps 40 persons in the area, which was known as East Calico. While Calico was less than a mile away, by airline, the direct trail was steep and rugged and the road roundabout. The government did not consider the population sufficient for a post office, and the miners didn’t care to hike into Calico for their mail. So they contributed to a fund to pay a boy named Dave Nichols to bring the mail over, by burro, from the mother camp. But Dave found a better job and no one else wanted to be mail man. About that time a man named Stacy, brother of the Stacy who was postmaster at Calico (their first names have variously been given as James, William, Everett and Alwin) opened a store at Bismark. The Stacys had a dog named Dorsey, a big Scotch collie who had come to them for shelter one stormy night. The Bismarck Stacy took the collie’ with him to East Calico. But Dorsey’s affections were divided, and after a few days at Bismarck, he ran away back to Calico. Postmaster Stacy attached a note to his neck, switched him and sent him back to Bismarck. After a few such runaways, Postmaster Stacy conceived the notion of tying a sack with newspapers in it on Dorsey’s back when he sent him home. Dorsey delivered them successfully, and soon little saddlepacks labeled “U. S. Mail” were made and attached to the dog’s back and a regular mail service set up between the two camps on a thrice-weekly schedule. 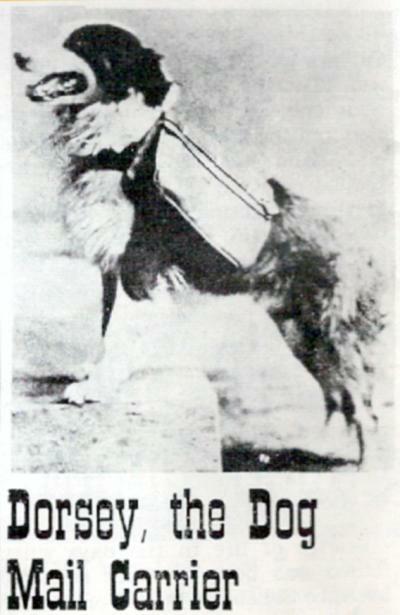 Dorsey soon became one of Calico’s most famous characters, but success did not go to his head. Though he was not a civil service employee and his mail route entirely unofficial, he was faithful in the completion of his appointed rounds. Though the miners enjoyed attempting to lead him astray or tamper with the mail, he managed to elude them, then resume his course. There is only one instance of possible misuse of his office on record. One Christmas Herman Mellen was living in a cave near Bismarck and his mother sent him a box of candy and sweets. Stacy had tied this box under Dorsey’s neck, and when he arrived at Bismarck the bottom was out and the contents missing. Whether temptation had proven too strong, the goodies had been hijacked or whether the package had broken open, allowing the contents to spill out was never determined. The famous dog mail carrier continued his route for two years, until a dip in the boom caused the mines of East Calico to close and mail service became unnecessary. When the Stacys left Calico, they gave Dorsey to John S. Doe, wealthy San Francisco man interested in Calico mines, and Dorsey spent the rest of his life in comfort and ease in the Bay City.